– Ontario schools inspector J.E. Wetherell gave high marks to the newly opened Picton Collegiate, stating it would not be surpassed by any other high school in the province. Of 14 areas of consideration, the school received top grades in 11. The others were scored incomplete as the school was not finished. 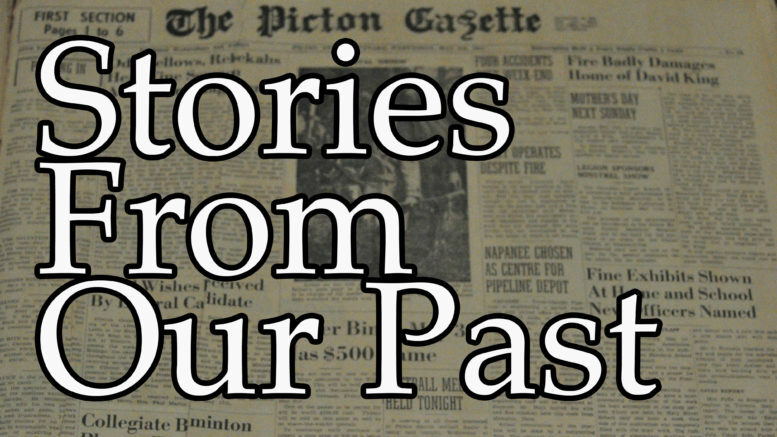 – Picton made a deal with the County to improve the deplorable conditions of Talbot Street. The County would lay stone at no upfront cost, while Picton would rent out its roller to pay for the roadwork. – Bloomfield councillors authorized the issue of debentures in the amount of $8,000 to improve highways, streets, and walkways within the village. – Glendon Farrington was to appear in Picton court after breaking out of jail and being found with an offensive weapon. He escaped the Picton jail overnight where he was waiting to be transferred to the Guelph Reformatory on a two-year sentence. Farrington was found within two hours in a woods near where he used to live. – A blue-winged teal banded by Dayton Murphy in Wellington was shot in Trinidad. It had travelled farther than any of the migratory birds Murphy had tagged. He was informed of the discovery Washington, D.C.’s Biological Survey. – County native Louis Hudgin found success abroad as he was elected as the mayor of Nogales, AZ, where he lived for 42 years. – Picton fire chief Duane Foshay resigned from his position after failing to secure council’s support for higher salaries and additional equipment. He asked for a car allowance, a phone extension at his house and pension contributions. Council appointed Leonard Tripp as his replacement on an interim basis. – Hallowell reeve George Vincent confirmed the federal government planned to meet with his council, Picton’s council and other parties interested in the future development of the Camp Picton property. – Prince Edward Collegiate teachers and the Prince Edward County Board of Education reached an impasse in salary talks and appeared headed toward mediation. – A 47-year-old Consecon man fired shots at Picton OPP officers responding to a disturbance at a residence. Police fired warning shots into the air in response. A short time later, the man surrendered. He was charged with possession of a dangerous weapon, making threats and placing obscene phone calls. Two shotguns, two rifles, and a quantity of ammunition were seized. – A vicious late-winter storm killed eight people across Ontario. Locally, winds of up to 100 km per hour downed trees and power lines and caused property damage. – Long Point farmer Rico Antognini announced plans to open a poultry processing plant in Picton. It would offer one-day plucking service for a wide range of fowl.